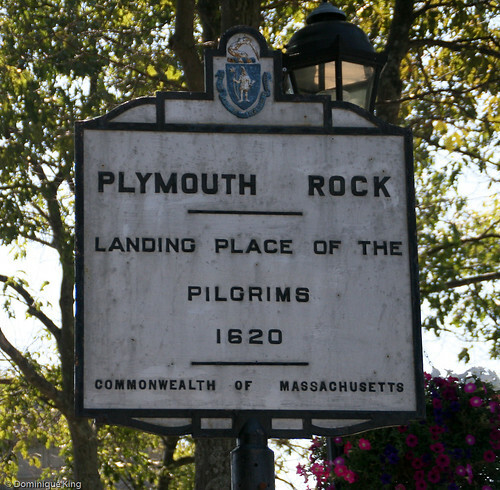 We visited Plymouth Rock and the Mayflower II when we traveled to Massachusetts a couple of years ago, and I thought it might be nice to share a couple photos from that trip as we get celebrate our Thanksgiving holiday in the U.S. today. I think many of us grew up thinking Plymouth Rock must be some huge boulder dominating the shoreline, but that isn't the case at all. The rock itself is rather small, and we really couldn't get a decent photo of it as construction and barriers obstructed any decent view of it during our visit. But I got a perfectly nice photo of this historic marker near the site! We did get some nice photos aboard the Mayflower II, a representation of the original Mayflower and part of the area's effort to dispel some of the myths and misinformation surrounding the story of the Pilgrims, their trip to the New World, and their relationship with the Native Americans already living here at the time. 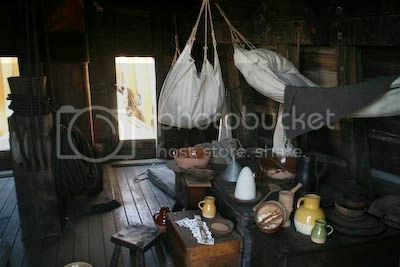 Check out my stories Aboard the Mayflower II and Living history at Plimoth Plantation to read more about the holiday, life in the area during the 1620s, and the "first Thanksgiving". Here are a couple of photos for those who complain that the stores and malls immediately jump from Halloween displays to the excessive store displays often associated with Christmas. 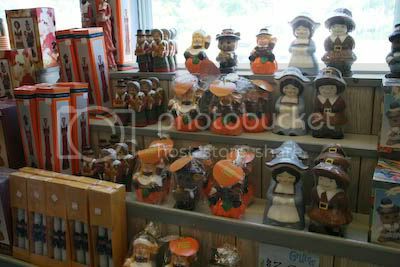 Several touristy gift shops along the waterfront in Plymouth, Massachusetts have plenty of Thanksgiving holiday tchotchkes, trinkets, knickknacks and whatever on display. We saw this when we visited one hot and humid day at the end of the summer and stepped inside one of the stores to enjoy the air conditioning. 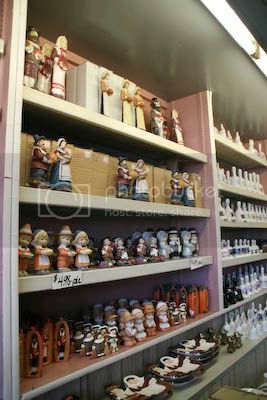 You can certainly get your fill of ceramic Pilgrims and plastic Mayflower ships here! 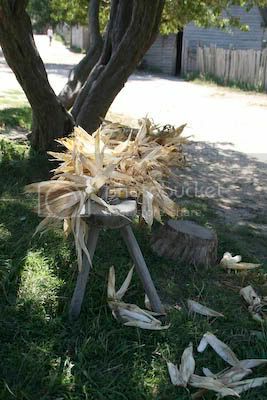 One woman busily husked corn in the bright sunshine at the village center as another woman carefully crafted a bowl under the sheltering trees near a cooking fire at her home just a few minutes’ walk away from the cornhusker. The common threads of caring for family ran through both vignettes, but the scenes at Plimoth Plantation were worlds apart in many other ways. Plimoth Plantation presents a respectful representation of life in two distinctly different cultures. 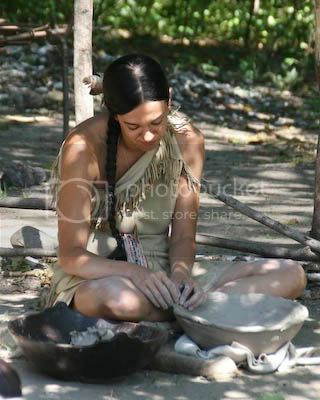 Modern Wampanoag and other Native Americans represent the Wampanoag living and working in Patuxet, while a cast of interpretive role players represent life in a neighboring 1627 colonial village populated by English settlers near the area now known as Plymouth, Massachusetts. We left our car in Plimoth Plantation’s huge parking lot and took a short walk back in time to the wooded Wampanoag homesite. Signs along the trail urged visitors to ask questions and interact with the Wampanoag. The signs also gently reminded visitors to avoid culturally insensitive questions and stereotyping. This struck me as a slightly disturbing comment on the depth of the differences and misunderstanding existing between differing cultures, but these are differences that Plimoth Plantation strives to respect as the site educates visitors about the Native Americans and English settlers working and living there in the 1620s. The wooded site and quiet industry of the Wampanoag as they worked in their home and gardens lent the site a sense of serenity, while the starkly sunlit colonial village and more vocally businesslike manner of the Pilgrims seemed to lend the village a more relentlessly bustling character. The contrasting character of each community only served to highlight a common strength of character that allowed both communities to carve homes out of a harsh land and climate. Dusty trails led uphill to a fort that served as a defense for the colonial village, as well as hosting community meetings and worship. 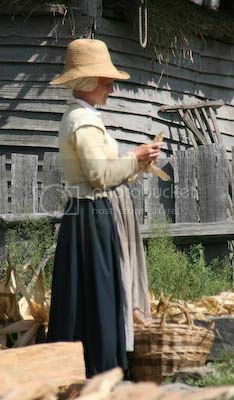 The village buzzed with activity as settlers prepared the harvest for use, maybe to cook in one of the settlement’s outdoor community ovens, and for preservation to last the harsh Plimoth winter. Villagers acknowledged us and genially wished us “good morrow” as they continued their constant labor. 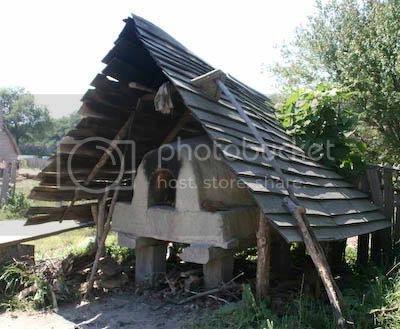 Each thatch-roofed home in the village bid us to enter through open doors and see where the early Pilgrims spent time with their families, slept and arose to another work-filled day. The Plimoth Plantation guidebook I purchased at the site’s gift store (yes, there’s always a gift store at these places, and I always end up with at least one book when I visit!) explained the site’s name. The spelling of P-l-i-m-o-t-h comes from a spelling used by early Plymouth Colony governor William Bradford in a history about the area. Seventeenth-century English people commonly used “plantation” to describe new colonies, or places they planted with people. 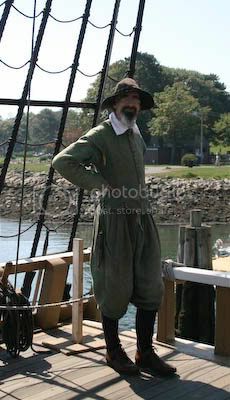 And it’s the people that make Plimoth Plantation come alive for modern visitors. Spending a pleasant day strolling through the 1627 village and returning the cheerful greetings of the industrious Pilgrims, or spending time with a Native American woman who showed me the soup she was preparing for her family and explained how she carefully maintained her cooking fire, gave me a new respect for the hard work required of each community to carve a decent life for their families out of the 1620s wilderness. 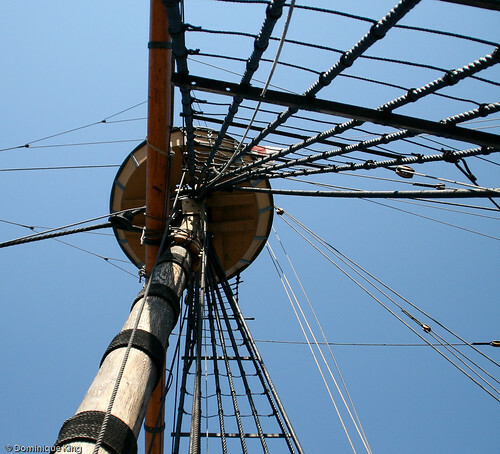 The Mayflower II is part of Plimoth Plantation, and you can read about our visit to the ship here. The main Plimoth Plantation complex also includes a Crafts Center and a few conventional indoor museum exhibits in the Visitor Center near the entrance. Museum visitors learn that the “first Thanksgiving” was really a harvest celebration, coupled with military exercises and diplomatic events during a three-day meeting between the Wampanoag and English colonists in 1621. It wasn’t until much later, in 1863, that President Lincoln declared Thanksgiving as a national holiday for expressing gratitude. In any case, if you’re celebrating Thanksgiving this week, enjoy! And thanks to everyone visiting Midwest Guest! A queue dutifully formed in front of a small construction project enclosure along the waterfront in Plymouth, Massachusetts as tourists, eager to see the Plymouth Rock many of them learned about in elementary school, waited to see the famous boulder. Work to update the display area to better preserve the surprisingly small rock meant that the partial glimpse people could catch of Plymouth Rock through a small window in the enclosure was unsatisfying and offered no photo opportunity to document their visit on a stifling hot day this past September. 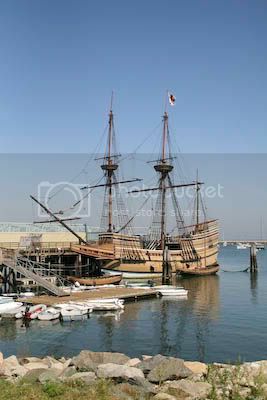 A better and more interesting opportunity to learn more about the Pilgrims and their landing in the New World was just a short walk down the street where the Mayflower II stood ready to receive visitors. Many of us believe we know the story of the Pilgrims, their crossing and their subsequent relationship with Native Americans as they settled into their new home, but the story told to young school children often suffered from a certain tinge of myth and misinformation. Efforts to present a more accurate version of events continue at interpretive sites like the Mayflower II and nearby Plimoth Plantation. Research failed to find pictures of the original Mayflower, so the Mayflower II is a meticulous representation of the original ship based on specifications common to ships of the same time period. There are a few concessions like a staircase, instead of a ladder, leading below deck and electric lighting in particularly dim portions of the ship designed to accommodate modern visitors and their ability to more readily tour the ship. Warwick Charlton, a veteran of World War II from England, envisioned a recreated Mayflower as a way to celebrate the close cooperation enjoyed between his country and the United States during WWII. 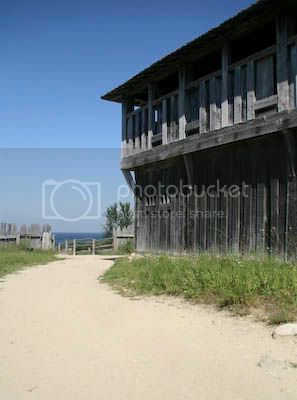 Charlton’s search for a home for Project Mayflower led to approaching Plimoth Plantation, the interpretive museum dedicated to the colonial and Native communities in Massachusetts during the 1600s. Museum officials agreed to maintain and exhibit the Mayflower II in Plymouth, Massachusetts. Construction of the recreated vessel began in 1955, using period-specific materials. Upon completion, the ship launched under her own power in 1957 and made the crossing to a new home in America. 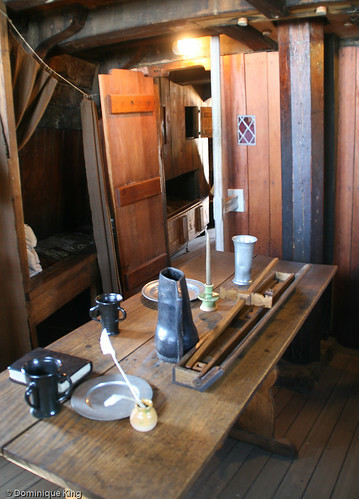 The ship visited several U.S. ports before setting in Plymouth under the auspices and ownership of Plimoth Plantation. Stepping aboard the Mayflower II gives you a relatively realistic idea of the cramped conditions endured by the Pilgrims as they journeyed overseas. When you learn that 102 passengers made the trip, and one baby was born during the passage, you gain an even better understanding of their hardships during the voyage. 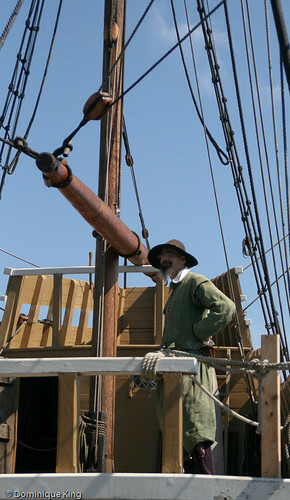 Guides stationed throughout the Mayflower II explain many of the ship’s features. One of our guides explained how ship’s deck prisms inlaid into the deck allowed light below deck. 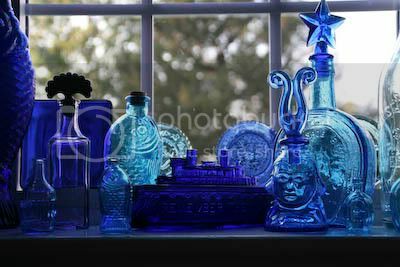 I’d seen these conical pieces of glass sold as paperweights in various museum gift stores without ever knowing their true use as safe alternatives to candlelight or other dangerously flammable lighting options. Costumed interpretive role players lent an extra touch of authenticity to our visit. We talked to the man immersed in the role of a ship’s master, who confided in us about his concerns over the large expense involved in keeping his ship afloat. Role players undergo extensive training. Costuming and a dedication to recreating the dialect and attitudes contemporary to the 1620s are key components in recreating a character that enriches visitors’ understanding of the true story of the times and people who sailed aboard the original Mayflower. Bill Rezek’s enthusiasm and pride in Historic Jacob Hill Inn at Seekonk, Massachusetts is apparent the moment we arrive and check in for a four-day stay. Our tour of the inn begins with the common areas and our own accommodations, the luxurious Providence Suite. We’re immediately impressed with the quality of the property and amenities. We’re even more impressed when we find that Bill and his wife Eleonora did most of the renovating and decorating themselves over an 18-year time span. 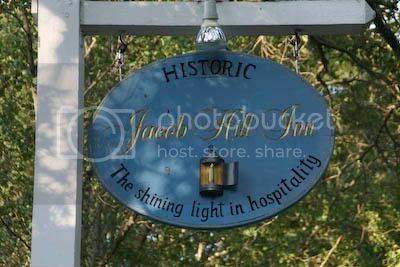 The Allyn family built the Historic Jacob Hill Inn’s original building during the 1720s. 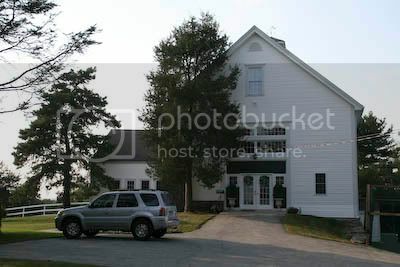 Subsequent additions and owners, including the property’s time as an affluent Hunt Club, resulted in a sprawling property with several buildings that Bill and Eleonora purchased in 1991 to transform into an inn. Our bathroom is a luxury retreat that includes a large Jacuzzi tub, a small electric fireplace stove and sparkling white finishes. We quickly find out that Bill did plumbing and contracting in a previous career. It’s a weekday just after Labor Day, so we’re the only guests at the inn for the moment. 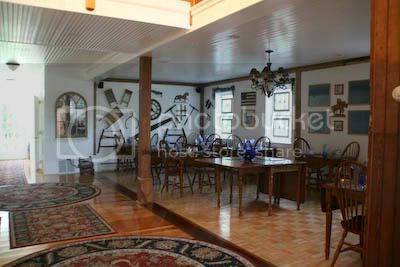 Bill is willing to show us the rest of the rooms in the inn, and we quickly take him up on the offer to tour the entire property. Seeing the custom touches that make each room and suite so unique leaves no doubt as to why the inn is on the prestigious Select Registry and carries a four-diamond AAA rating. On-site amenities include an outdoor swimming pool, tennis court, spacious grounds and a large recreation room featuring ping pong and pool tables, as well as a large plasma screen television. But, a large rack of brochures about local attractions, coupled with Eleonora and Bill’s expertise in helping countless visitors plan fun and interesting stops around the area, leaves us with the dilemma of what to do first? We contemplate our options over the cheese plate and beverages Bill offers us (something available to inn guests each evening). Historic Jacob Hill Inn sits on a quiet road just minutes outside of downtown Providence, Rhode Island, offering the best of both worlds--a quiet country retreat near a bustling big city. Each day at the inn starts with a hearty breakfast featuring selections like fresh fruit and pancakes stuffed with fruit jam and cream cheese. Eleonora and Bill then help us plan our days, offering us printed driving directions for many of our destinations, making dinner reservations, suggesting places to dine while we are out during the day and helping us decide where to go. We visit the Museum of Art at the Rhode Island School of Design, wander around campus at Brown University, photograph homes and churches along Providence’s historic Benefit Street, drive down to Cape Cod and enjoy a massive lobster roll for lunch at The Dan’l Webster Inn, enjoy a great Italian meal at Zooma in Providence’s historic Federal Hill area and spend a day at the Mayflower II and Plimoth Plantation. 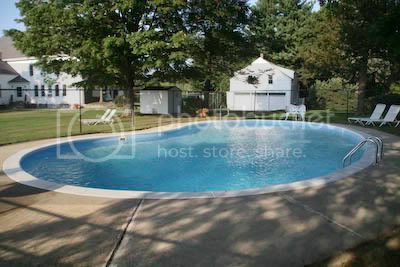 Hot, humid days during our stay make me especially appreciative of the inn’s swimming pool, a rarity I’ve seen at very few B&Bs and country inns. Even as Tropical Storm Hanna tripped through the area one night, Bill was out early the next morning clearing the spotlessly maintained pool of any storm debris so I could enjoy my swim later that afternoon. While the impressive property gives the inn an air of genteel, yet comfortable formality, the hosts’ warm hospitality adds to the inn’s homey and relaxed vibe.